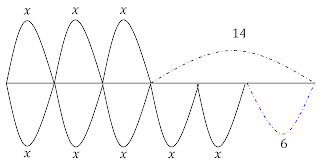 Logarithms are often seen as one of the most complicated and abstract concepts in secondary mathematics. Consider these problems. Even for those who can solve the problems using abstract procedures, most would struggle to find meaning in the problem. 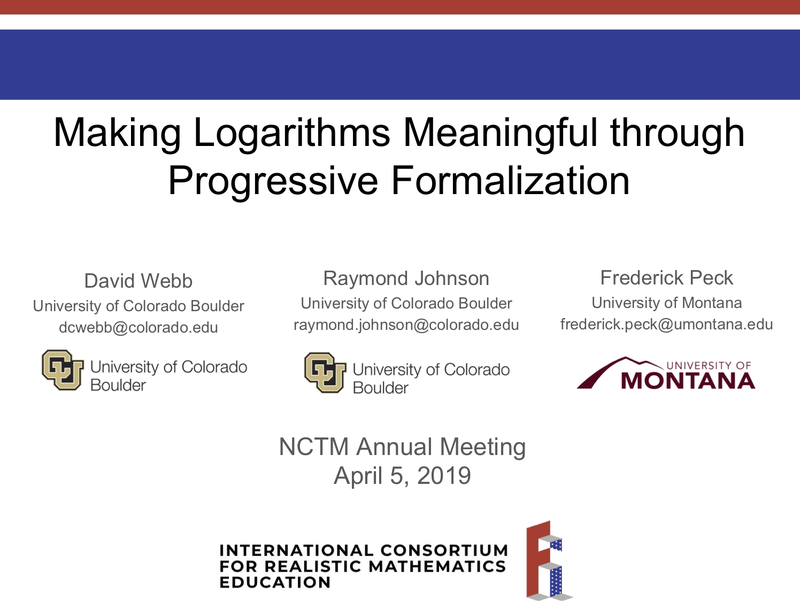 In this session, we shared a unit that makes logarithms meaningful. 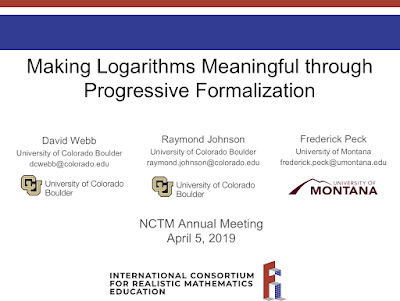 The unit uses realistic contexts and multiple representations to help guide students towards an understanding of progressively more formal logarithms. You can download the slides and the complete unit below. The unit was initially developed by Henk van der Koij, with input and further development from Monica Geist and David Webb. The unit has been taught at many high schools, community colleges, and universities. 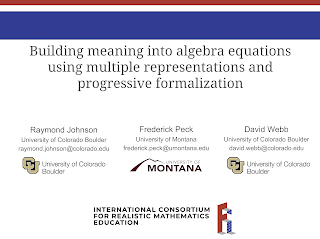 This session is based on my work as an algebra teacher and research. 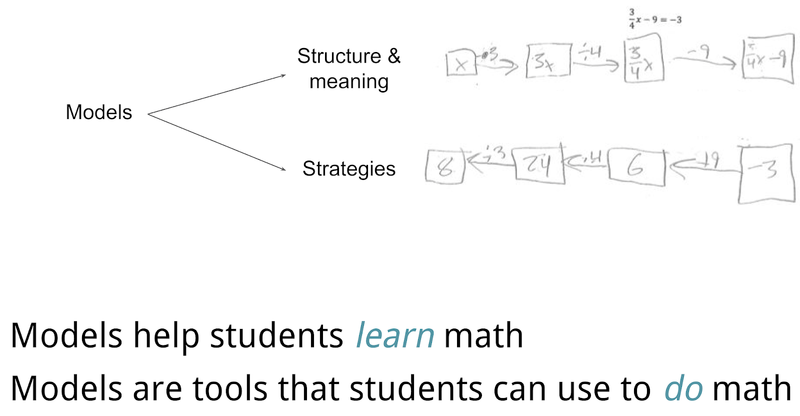 I also drew on ideas that my colleagues Raymond Johnson and David Webb presented at NCTM. The session focused on how to make algebraic equations and manipulations meaningful for students. The theme of the session is the relationship between models, structure, and strategy. 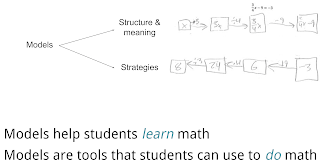 I introduced two models for algebra equations: a balance model and an arrow chain model, discussed how each model produces a different structure for algebra equations, and how each model can be used develop meaningful strategies for algebraic manipulations. I also discussed how the models can be developed through progressive formalization of informal contexts. A number line is also a great model for algebra equations. 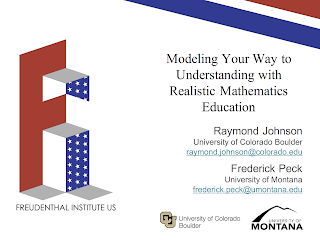 Raymond Johnson, David Webb, and I facilitated a session at NCTM 2018 in Washington DC. 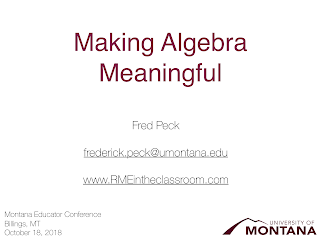 In the session, we introduced two models for algebra equations, discussed how each model reveals a different structure, and how each model can be used develop meaningful strategies for algebraic manipulations. We also discussed how the models can be developed through progressive formalization of informal contexts. MEA/MFT 2016 - Beyond Rise over Run! 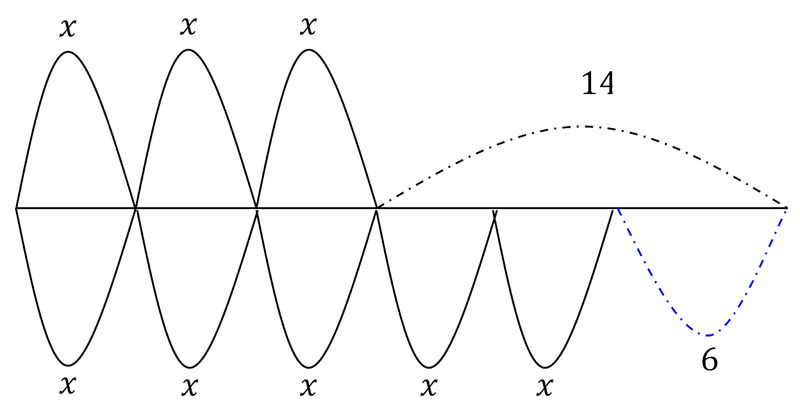 Slope is more than just “steepness” or “rise over run.” Slope has five—count 'em, five—faces. Students shouldn’t focus on just one or two, and in this session, neither will we! 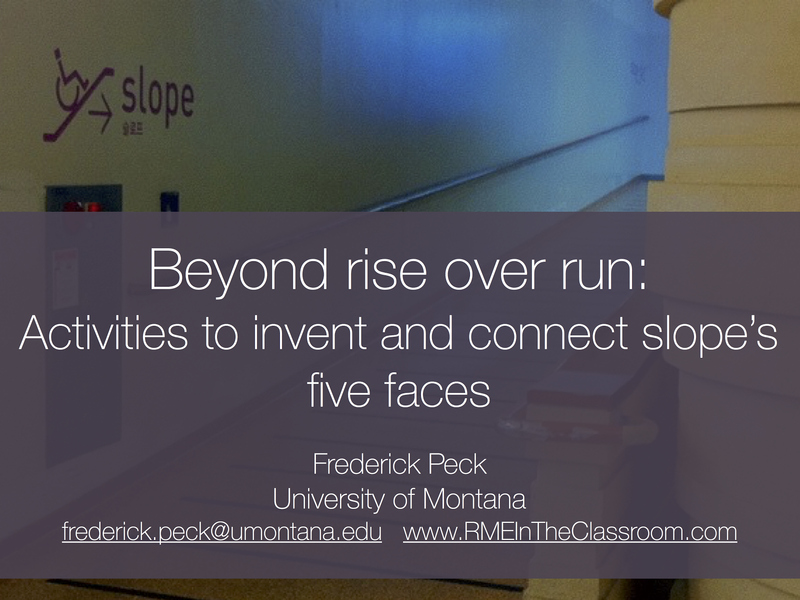 We'll explore a sequence of learning activities that guides students to invent and connections all of slope’s five faces through engagement in realistic and meaningful activity. 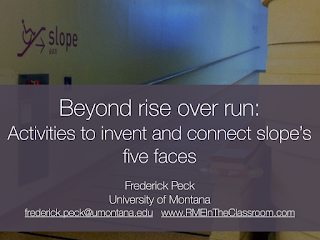 The sequence is grounded in research literature, tested in classrooms, and aligned with the Montana Common Core. 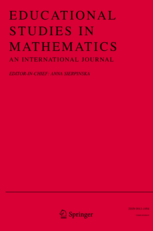 In this paper, Michael Matassa and I explore a problem of practice that we experienced as algebra teachers. Namely, we noticed that students in algebra often struggled with division when the quotient is not an integer (e.g., 7÷9). Furthermore, even though division is always represented as fractions in algebra courses, we noticed that students rarely, if ever, represented quotients as fractions. We therefore set out to explore student thinking around fractions and division. Subsequently, we engaged in a design study—oriented around RME design principles—to guide students to reinvent the relationship between fractions and division. For example, the "bar model" for fractions is a preformal production. So is the "partition, distribute, iterate" strategy for fair sharing. In the figure below from the paper (p. 255), one of the students in our study is using both of these preformal productions to find the equal share when 5 people share 4 sandwiches equally. We found that preformal productions played two key roles for students. 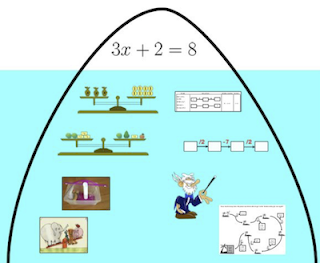 (1) Preformal productions help students do math. 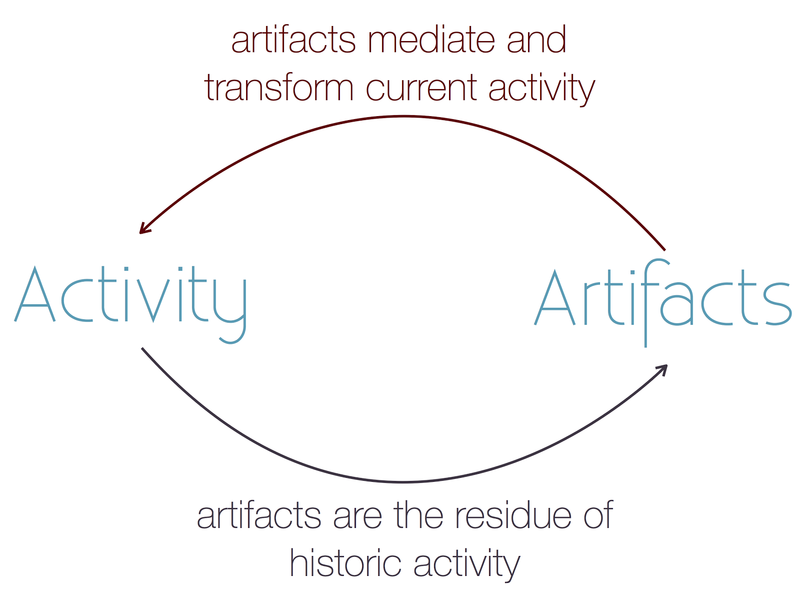 In the paper, we document how preformal productions emerge in the classroom, and we argue that preformal productions should be considered cultural artifacts: shared and durable features of communities, not simply individual cognitive possessions. With respect to our initial problem of practice, we provide detailed descriptions of students' understanding of fractions and division, and we provide an activity sequence that can help guide students to reinvent the relationship between fractions and division. 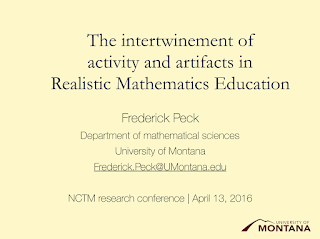 Raymond Johnson and I facilitated a session on RME for high school teachers at NCTM 2016. 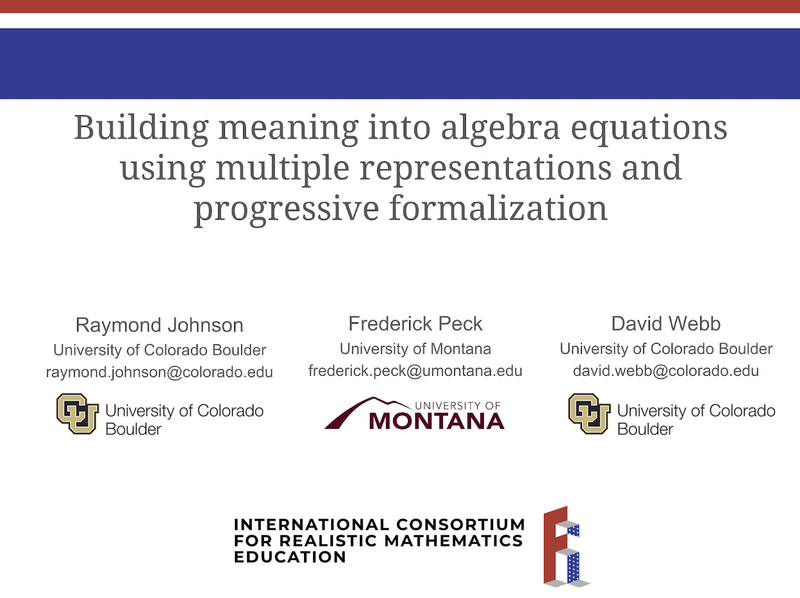 In this session we discussed the unique way that "modeling" is conceptualized in RME (as organizing rather than translating), and we exemplified the RME approach by engaging participants in an activity sequence that guides students to reinvent formal operations with quadratics and polynomials. 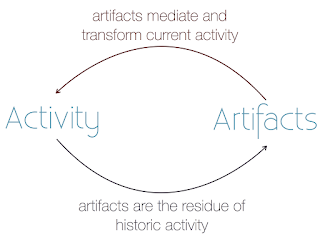 From this perspective, mathematics artifacts are not private mental objects, but rather they are things in the world. 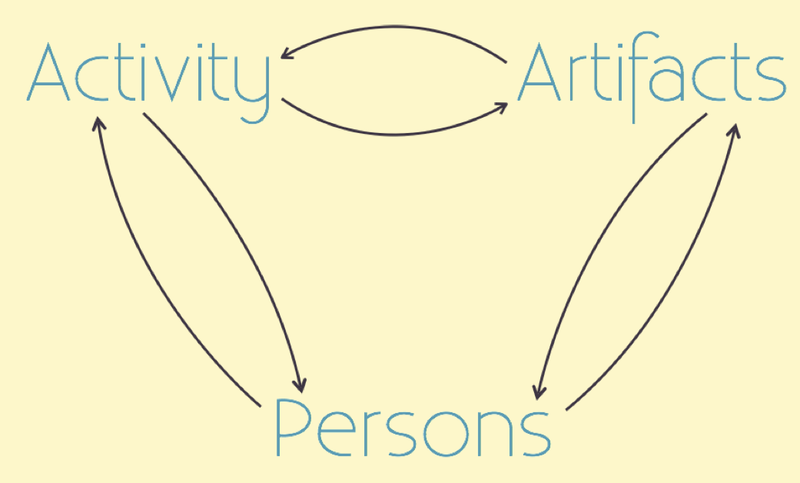 They are durable and shared, and they exist across people and time (within a social group). 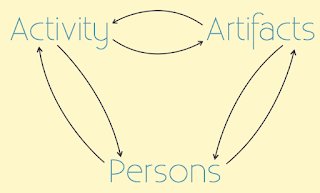 Furthermore, activity is not private mental activity, but rather it is the accomplishment of a system composed of both persons and artifacts. To learn more, you can download the presentation and/or the paper.